Sundyne develops and manufactures pumps and compressors for petrochemical processes (oil & gas) all over the world. Sundyne employs over 900 people worldwide, and its head office is in Arvada, Colorado, USA. At the French site in Dijon, engineering experts sought a windows-based software with advanced database intelligence which can, among other things, create P&IDs, interactively manage content-related documents and is easy to use. After a thorough examination of the market, Sundyne opted for Engineering Base (EB) because it was persuaded, on the one hand, by AUCOTEC‘s experience both in process engineering and electrical engineering as well as by EB‘s performance also with changes, and on the other hand, by the rapid support by AUCOTEC on-site. The introduction of EB was a major change because Sundyne had up to then a variety of different tools whose documents were unrelated and whose data could not be jointly managed. P&IDs were treated like photos. This cost a lot of time. „Today, all devices recorded in the P&ID, the device list and all documents related to the machine wiring are linked automatically to their equivalents in detail engineering. The data only has to be entered once and one can navigate absolutely continuously in the EB project“, explains Alain Cuenot, Head of the Department of Logic, Control & Instrumentation at Sundyne in Dijon. Updates are also automated by the interactivity between documents and devices. For changes to device names before EB, all diagrams and lists which contained this device had to be updated manually. At the same time, EB has standardised Sundyne‘s engineering processes. There are now predefined templates for loops, lists and graphics and the confusion from different self-made documents is coming to an end. „The quality has thus improved significantly, also due to the easy to use Windows environment“, reports the manager. Thanks to the openness of EB, Sundyne already has the integration of 3D and control systems as well as the PLC connectivity in its sights. 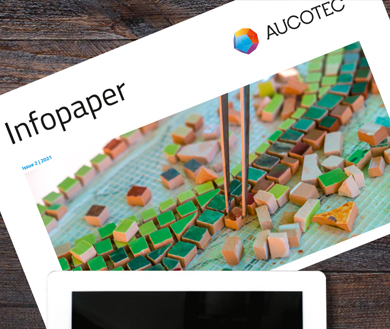 „The possibility of adjusting to individual customer requirements is very important to us and we greatly appreciate AUCOTEC‘s flexibility“, says Alain Cuenot. „For a permanent and intensive collaboration with AUCOTEC towards more efficiency, EB‘s future-oriented architecture offers the best conditions“, thus his conclusion.